National Library Week is April 14-20, 2013! Help your library celebrate! Most libraries will be having some sort of special celebrations during the upcoming week. Our campus library is doing several, including a Fines for Food day, where you can bring in nonperishable food items to pay off a portion of your overdue fines in support of the local food bank. We’re celebrating our student workers with a recognition lunch, thanking them for their service throughout the year, with special recognition to our senior students, who will be leaving us in just a few weeks! We’re also doing an Edible Book Festival on Monday, which is great fun if you’ve never experienced one before (and even more if you have!). Book and word mongers gather in celebration of wordplay, cooking, and creativity — all for the love of books! The entries can be depictions of the title or characters, food that looks like a book, puns, or other creative ideas that weld together books and food. Take a wander through a Google search to see some of the amazing creations that have been put together for festivals around the US. I’ve been plotting my entry for a couple of weeks, searching the internet and my shelves, and mine will be no masterpiece. I’m not artistically inclined, especially when sculpting food-like things is involved. I’m far more inclined for a good pun. In fact, my first inclination was to do “The Bundt for Red October”. My husband, pulled into creative brainstorming, came up with a loaf of bread, topped with a beet as “Das Beet.” I even considered doing something from the Rare Book Room — the Book of Kell(ogg)s — but feared it overreached. So, I selected a lesser known book, but one of my favorites, so much so that I have a signed copy I’m loaning to go along with the display. Won’t win any prizes, I’m sure, but I had fun. I’ll share the results after we’re all done on Monday. How about your favorite library — are they doing anything special? 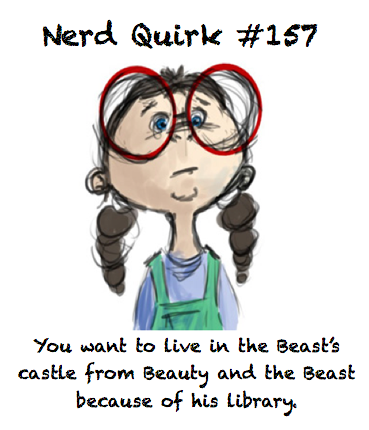 What’s the best thing about your favorite library? Make their week and tell them! Somewhere in a file folder, tucked away in a storage closet, I have my very first library card. I treasured that little magic piece of paper, the one that would let me have (on a temporary basis) any book I wanted to carry away with me. After I had worked my way through my bookshelves, including the full series of Nancy Drew, and through most of my siblings’ books as well, I discovered the library. Our school library kept me entertained for a while, and the public library in our small town lasted me through high school, especially once the librarians quit frowning at me for working my way through books they considered “not suitable” for my reading. This week is National Library Week, sponsored by the American Library Association. 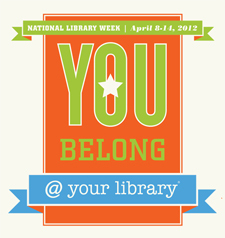 The theme this year is You Belong @ your Library, and I don’t believe that’s ever been more true than now! Somehow libraries seem to take a hit during rough economic times, as do other things sure, but I get peeved when I hear folks say that funding to libraries should be cut. The libraries of America are treasure troves of so many things: reading, groups, meetings, internet access, public service, and the list could go on for many pages! The amount of things available with a library card is amazing, and it is something that should be celebrated not cut, emphasized not downsized, especially in difficult economic times. As an archivist, providing access to information is part of my job description. I am fortunate to work within an academic library that prides itself on being a place of information, a place of knowledge and learning, and a staff dedicated to making student success a reality. While we are serious about helping students succeed, we also love to have fun. Since January, our fabulous library staff have been making a series of videos, available on YouTube, about our library, including ones on library luck, library love, and a dance dare! (I told you we rock!) The most current installment is about the Archives where I work. What’s your favorite library story? How have libraries been a part of your life? 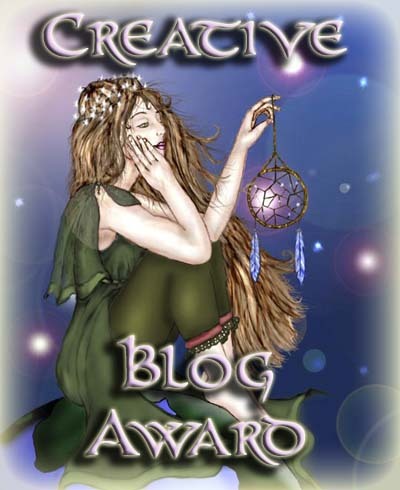 [Note: This post is #9 of 26 of the April A-to-Z Challenge. Please see the button on the right of the page for more information. 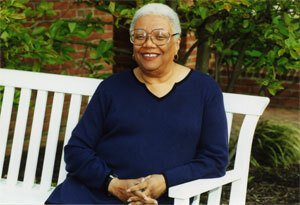 One of my favorite contemporary poets is Lucille Clifton. Although she passed away in 2010, her poetry has been published in various forms since the late 1960s. Her unabashedly honest writing, her mix of hard truth and humor, and her celebration of self in every form are some of the reasons her poetry calls to me. How do you celebrate the wonderfulness that you are? [Note: This post is #8 of 26 of the April A-to-Z Challenge. Please see the button on the right of the page for more information. My parents instilled that lifelong habit early. 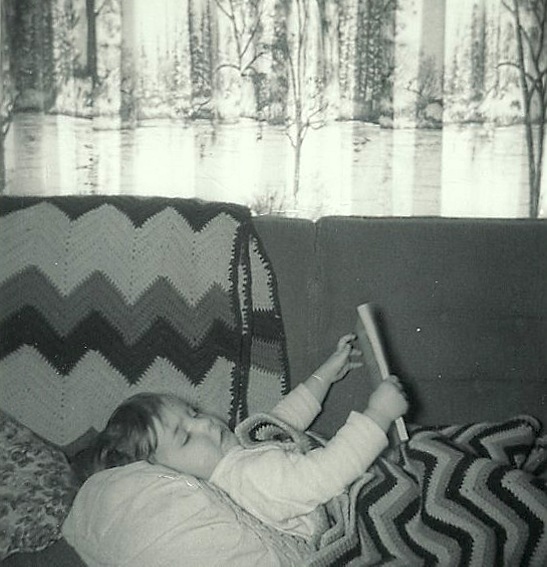 That’s me up there reading, most likely on a Saturday morning, since television came much further down the list of things to do than did books. My father, especially, loved to read, in part because he was a bachelor until he was 50, and reading occupied many hours in the evenings before he met my mother. Our house was filled with shelves and shelves of books, and many of my childhood friends treated our house like the local library. I was always happy to share my books. Even today, I lend books to friends who spy something on my shelves they want to read. When friends are sick, I load up a bag full of reading options along with a casserole or two to help speed their healing, or at least pass the time. My husband can always tell when a book I’m reading is really good because he has to pull me out of its world and back into ours when he asks me a question. When we merged our libraries the first time, we were startled to discover we shared the love of one book so much that we had each kept our childhood copy all these years. What was it? 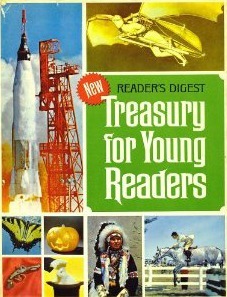 The Reader’s Digest Treasury for Young Readers He had grown up just as much a bookworm as I had. My husband and I chat occasionally about what we’d do if we ever won the lottery, as I’m sure many people do, especially when the winnings get as large as they did for last week. We started after we were first married planning what we’d do with our first million; now, fifteen years later, I think we’re up to how we’d spend our 17th or 18th million, if given the chance. 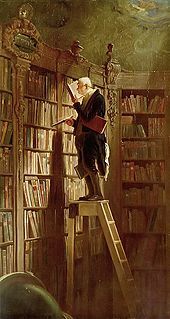 In my vision, I’d have a room something like the library in Beauty and the Beastor the one in the painting The Bookworm (1850) by Carl Spitzweg. But if I were going to fill such rooms, I’d need more books. I mean, really, I always *want* more books, but then I’d have the perfect excuse ~ there would always be shelves to fill! In the meantime, though, I’d love to hear your suggestions. What are some of your favorite books? And would my image in your heart abide? The kick-off was last Tuesday night, and it combined several pieces of the events which are available throughout the month. The complete series is listed on the poster above. Since I realize most of you aren’t anywhere nearby, I thought I’d share some of what we’re doing in a few posts this February. 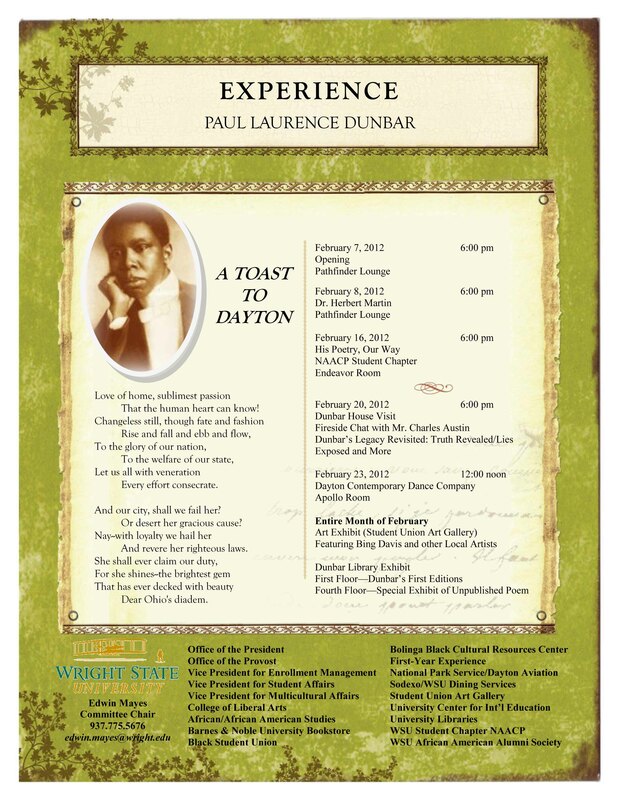 So, like the folks on Tuesday night, here’s a little intro to what all we’ve been up to with Paul Laurence Dunbar. Since 1992, the Wright State University Libraries has maintained a Digital Text collection of Dunbar’s published poetry on our website. 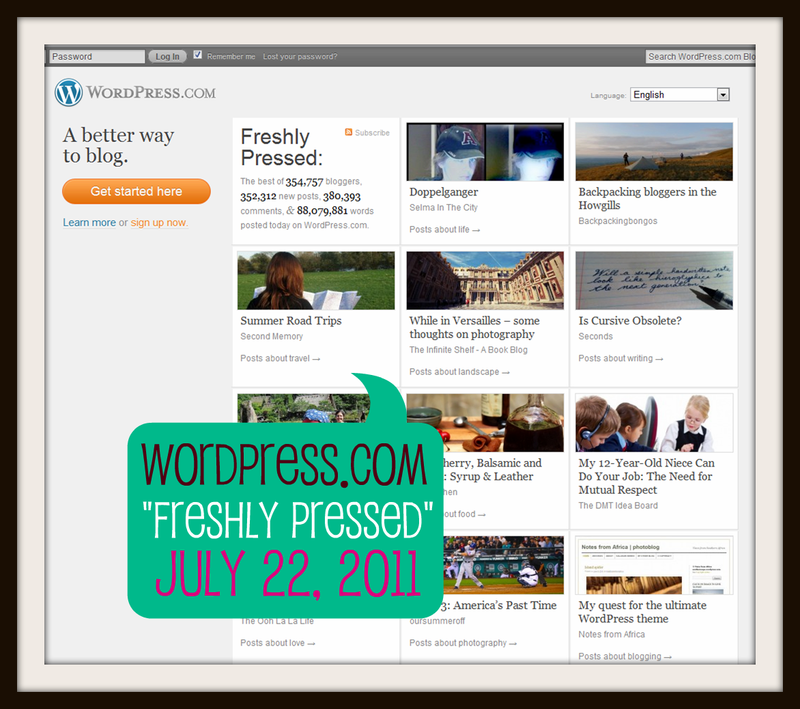 It consistently gets the largest number of hits out of any other portion of our site, in fact. So one of our contributions to the month-long Dunbar celebration was to completely revise, update, and relaunch the Paul Laurence Dunbar portion of our website. We added images to our photo gallery, wrote a new biography, and now provide information on visiting Dunbar sites in Dayton as well as a whole long list of resources about Dunbar for anyone interested in learning more about him. While our fabulous web designer developed the look and motion of the site, one of my jobs was to create and update content. That included proofreading and editing the code behind all 430+ Dunbar poems, which means I read each of them at least three times. There were some nights I swear I ended up dreaming in dialect! But it was a once-in-a-lifetime experience to be able to surround myself with one person’s poetry so thoroughly and completely. Anyway, on this February Monday, I hope you’ll take a moment and come check out our Dunbar site! Dunbar’s poetry influenced later writers during the Harlem Renaissance and throughout the 20th century and made an amazing contribution to American poetry and literature.